In a mesmerizing debut, cop-turned-author Donald Harstad uses real-life events to paint a jarring picture of crime in America's heartland--where two-stoplight towns no longer offer refuge from modern-day brutality. Life in Maitland, Iowa, is usually predictable, even for a cop. But all that changes the day Deputy Sheriff Carl Houseman's dispatcher receives the terrifying 911 call. The day cops find the mutilated bodies at a remote farmhouse. The first of eleven days Carl will never forget. As hotshot investigators fly in from New York, Carl and his fellow cops use old-fashioned detective work to piece together clues. But to turn suspicions into suspects, Carl must search among his closest friends to find a killer who has shocked and bewildered cops who'd thought they'd seen it all. And before it's over, Carl will be forced into an unrelenting spiral of chaos, coming face-to-face with evil he never dreamed could exist in Maitland...or anywhere else. Donald Harstad is a twenty-six-year veteran of the Clayton County Sheriff's Department in northeastern Iowa. A former deputy sheriff, Harstad lives with his wife, Mary, in Elkader, Iowa. 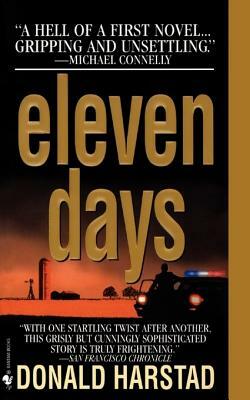 Eleven Days is his first novel. "A hell of a first novel... Gripping and unsettling." "With one startling twist after another, this grisly but cunningly sophisticated story is truly frightening." "Downright explosive! The descriptions of the police work rival Wambaugh's best."